Welcome to the retrospective of Scaleforum South West, which was held as part of Railwells in Wells Town Hall on 8th & 9th August 2009. 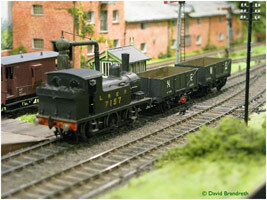 It was organized by Chris Challis and the Wells Railway Fraternity. For those of you who have never been, do come if you can as there are layouts in other scales - there were 14 layouts this year - and a good selection of traders (19), demonstrations and other displays. Details are on the Society's Shows page, which also has details of Scaleforum and Scaleforum North. My thanks to the photographers who sent in their pictures so they may be shared with you. These are: Dave Browne, Anthony Hubbard, Nick T Smith, Mark Tatlow and Nigel Twinberrow. Send pictures either by email (max 1Mb per email, please) or on a CD (I can supply the address). If you can reduce the photos to about 200kb each, that would be helpful, but don't worry if you cannot, I can. I hope you will enjoy this retrospective.